This is the 3rd video in Dr. Leonard Horowitz's Frequency Rehab program. The video program is supplemented by the doctor's 11 track audio album titled Solfeggio (Healing Frequencies) Eclectica. 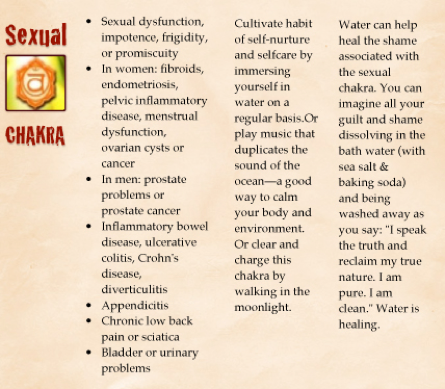 This video was developed to help balance your Second (Sacral) Chakra. Here music is performed in 432Hz that is associated with the color orange and the second energy vortex, although Dr. Horowitz makes clear that 432Hz is not a Solfeggio frequency, but it is a central frequency of nature, and harmonic of the 528Hz frequency at the heart of the Solfeggio. To purchase Dr. Leonard Horowitz's full Solfeggio (Healing Frequencies) Eclectica album CLICK HERE. To purchase the complete hour-and-seventeen minute Solfeggio Eclectica Music Video Therapy Program, CLICK HERE. The indications for this particular therapeutic music video are shown in the graphic below. This chakra balancing exercise follows the “grounding” exercises for “root chakra” therapy in tracks one and two of the audio album and the first two videos in the Frequency Rehab program. These recordings help the energy flow through your chakra system that parallels your spine. The "hydro-sonic flow" of energy through your chakras and body recharges your natural energy like a lightening-bolt grounds the energy in the charged-air restoring balance to the system. "Grounding," facilitated by the first two Frequency Rehab videos, is important to get energy to move between the chakras. To know whether you should buy this album, answer the following questions: "Are you a spiritual-being first, before you are a physical-being?" If you are not sure, then read this article. "Are you affected by sound?" "Does stress and certain music distress you while other music pleases you? Does peace and harmony restore your energy? Does music, or the "good vibrations" of nature, affect your soul? And would you like to quickly uplift your mood, health, happiness, and stay in "The 'Zone'" of total well-being? If you answered, "Yes!" to these questions, then you must purchase this product or better yet, the complete Solfeggio Eclectica Music Video Therapy Program. What's in the Solfeggio Eclectica products? In the Solfeggio Eclectica album there are 11 original musical compositions that feature the Solfeggio frequencies and more. This long-playing (1:28) album includes delightful tracks made with myriad instruments and orchestral arrangements featuring the six (6) of nine (9) “core creative frequencies” fundamental to nature, sustainability, and natural healing. You can listen to samples of these tracks by viewing the corresponding video trailer, HERE. These therapeutic tracks include the complete set of Solfeggio frequencies, including 396, 417, 528, 639, 741, and 852 Hertz. These frequencies of sound are used in this program to "balance your chakras," elevate your “consciousness,” rehab your health, and evolve you spiritually to enhance your self-healing capability. Three additional frequencies complete the “Perfect Circle of SoundTM.” These include 963, 174 and 285 Hertz frequencies. These frequencies derive from Dr. Horowitz research. You can use these frequencies, and music videos made in these keys, to kick addictive medicines, save money and maybe your life. Each of the eleven (11) music tracks on the Solfeggio Eclectica album run between eight and thirteen minutes. The full album runs for nearly one-and-a-half hours. Seven (7) of these audio tracks are composed, performed, and recorded in the six original Solfeggio frequencies. The fourth track is a binaural recording featuring two harmonic Solfeggio pure tones, 396Hz and 528Hz. 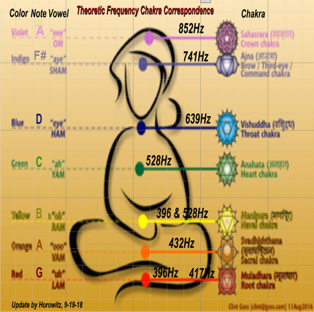 The third track and video (“sacral chakra” or “sexual chakra”) uses the 432Hz frequency that research indicates is best for balancing your second energy center as shown in the chart below. The Solfeggio (Healing Frequencies) Eclectica album is sold separately from this video and related video packages. But it is included in a special package with the complete set of videos in the Complete Frequency Rehab Solfeggio Eclectica Music-Video Therapy Package. The set of music videos adds positive affirmations, prayers, and transfixing "color therapy" to match each of the seven (7) chakras. This is a POWERFUL PROGRAM. This product is not to be misconstrued as helping to diagnose or treat any medical illness. The reason being, we don't believe in the "practice of medicine" that is based on false doctrines in health science and the monopolization of healthcare by Big Pharma. That corporate-controlled racket has neglected the bio-energetic and bio-spiritual forces and factors more powerful than bio-chemistry and molecular biology, in our opinion. The global enterprise has neglected the impact of sound and light signaling on electro-genetics. "Modern medicine" neglects the poisoning of natural systems by drugs causing toxic, albeit profitable, side-effects. We don't even believe in the "labeling" of diseases that impacts patients' attitudes, states of mind, points of view, behaviors, and outcomes in the therapeutic relationship. Alternatively, we view ill health as a "process" by which the natural systems seek homeostasis, balance, and return to natural/normal functions. This "process" of healing involves the restoration of free energy movements in your body, particularly through your chakras and energy meridians. Click the button below to add the Second Chakra Therapy (432hz) Streaming Music Videos (Instrumental & Narrated) to your wish list.